The pair first met playing golf in the 1960�s and were friends for years before they married; Joan she became Lady Bader when Sir Douglas received his Knighthood in 1976. After Douglas Bader�s death in 1982, Joan established the Bader Foundation in his name to help people who had lost limbs to rebuild their lives. Overall size: 25" x 19 3/4"
Includes a small portrait of Douglas Bader printed in the left border. * Review the Rules and Details page for exclusions by logging in to your Rewards account. 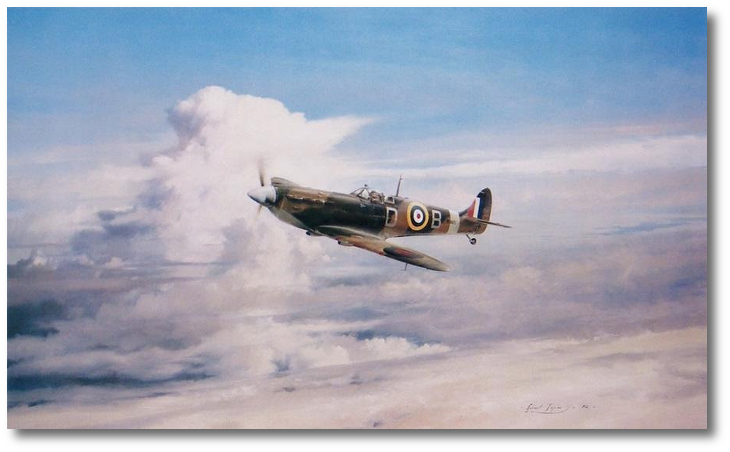 Published in 1982 it was intended that these prints would be signed by Sir Douglas Bader. Sadly the legendary pilot passed away before it could be completed but the edition was released as a lasting tribute. In 1931 Douglas Bader, then a brilliant 21 year old RAF pilot, crashed in a Bristol Bulldog fighter in a flying accident and lost both legs. 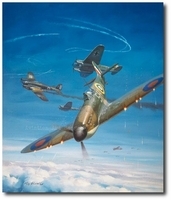 At the outbreak of war his relentless persistence saw him re-join the RAF and by 1940 he was leading the famous 242 Sqn in the Battle of Britain. He then went on to cmmand the famous Tangmere Wing and at the time he was shot down and taken POW in August 1941, he was a leading Ace with 24 victories and one of the most famous RAF Fighter pilots. After being interned in a number of prison camps (including Stallag Luft III) his persistent escape attempts saw him finish the war in Colditz. After the war he became a household name and his Foundation gave a huge amount of support and encouragement to other limbless people. Robert Taylor�s famous painting depicts legendary Ace, Douglas Bader flying his Mk.Va Spitfire high above the coast of Northern France in 1941.